Indian Railways can reduce its carbon dioxide emissions by 239 tonnes per year per train by fixing solar panels atop coaches. 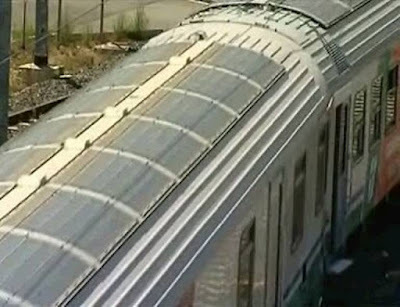 A team of researchers from Indian Institute of Science in Bengaluru calculate that installing photovoltaic panels atop coaches can reduce 239 tonnes of carbon dioxide emissions per year per train, which is roughly equal to the annual emissions of 50 cars in the city. On an average, 11,000 trains ply in India every day. The researchers say the Railways can save close to Rs 60 lakh annually on each train by shifting to solar panels. Lead researcher Sheela K Ramasesha and her team calculated the energy consumption pattern of a train with 19 Linke Hofmann Busch (LHB) coaches, which are used in superfast trains such as Rajdhani, Shatabdi and Durunto. The Railways plan to introduce LHB coaches in all the trains in the coming years. They found that to make a 1,800 km trip, a rake (comprising of 19 LHB coaches) consumes 3,000 litres of diesel for auxiliary energy needs such as lighting and cooling. “Assuming that the rake makes 188 trips in a year, our calculations indicate that 90,804 litres of diesel can be conserved every year, with a saving of Rs 59,93,064, by putting solar panels on the train,” says Ramasesha. The researchers suggest that the estimated price of an LHB rail coach with a solar power generation system is 4 per cent higher than the price of the present LHB coaches. The investment would be recovered within two-three years, they say. Talking about the feasibility of the project, It is clear that the energy that can be harnessed during sunshine hours is much more than the requirements of the train even during the shorter days of winters. The researchers, as a result, suggest the installation of batteries to store excess energy to be used at night. In an ambitious plan to tap solar energy, the Delhi division of the Northern Railway is all set to use trains to generate solar power by the year-end. For the purpose, the railway authorities will roll out first train with solar panels fixed on its roof by the end of this year. According to senior official of the Delhi rail division, the trial run of a passenger train with solar panels fitted on top of one of its coaches was successfully completed and a train fitted with solar panels on all its coaches will run by end of the year. Solar power generated the moving trains will be used to meet the requirements of the trains themselves. According to divisional railway manager Arun Arora, the trial run was successfully completed on Sitapur-Rewari passenger train and one coach had generated 1.3 KW of power. “The power generated by the solar panel set on the train top will be used to meet lighting and other electrical requirements of the coaches,” said Mr Arora. The railways will spend Rs 4 lakh for installing solar panels on each coach. “With a rate of return of 25 per cent in a year, the railways will recover the installation cost in four years. After four years, it will help the railways to save power bills,” added Mr Arora. As per initial plan, solar panels will be fitted on passenger trains which originate and terminate within the jurisdiction of the Delhi division. “In the first phase, we will run passenger trains fitted with solar panels. In the second phase, mail or express trains will be fitted with panels to generate solar power to meet requirements,” said Mr Arora.